A youngest business tycoon, ruthless , arrogant, stubborn and intelligent to the world but to his family he is loving , kind , beloved ,caring and protective man . In short ram is a family man who was married to a woman he met accidently . This ruthless man fallen head over heels in love with her . He is a one woman's man . His lady love is Priya. Ram was 3o when he married Priya. Apeksha - Ram's first sister. Very simple, beautiful .She loves ram so much for her brother is her mentor. Joined her father's business after her MBA from London . She takes care of ram's business in Australia she stays there with her husband . Ram's second sister . she also loves her brother . she was pampered by ram so much . stubborn girl was married to karthik . passionate of her work which made her stand her one among the top most fashion designers in india.
' He did his MBA . joined ram after his education. He adore his brother respect him so much . mothers , dadi's caretaker and bhabi's dear dewar. Charming guy. Siddanth : He is a copy of his mother, clone of his mama in evilness. SPOILT BRAT. He never cared for anyone. He is always around women. He a big Casanova. he hates priya as rams wife. He hates PRIYA as ram's wife. he is mentally ill , once he tried to molest priya in a party before her marriage. After the marriage he was after her sister . he is raging in anger to take revenge of the slap priya gave him in front of everyone. Very pleasant, sensible , beautiful , happy go lucky lady. She never cared about the negligence she received from her mother , was overwhelmed with the support from her father and brother. Profession is a ASST.PROFESSOR in a B school . She did her HR management and was a gold medallist. She was also interested in social work she was always been a support to NGO'. Ram is her everything she agreed Ram's proposal not for his riches. She is deeply in love with him , she respect him a lot. She was 28 yrs old when she married ram. She loved ram's family as her own .sid was her headache always, she punished sid for his attempt to molest her in the party which she attended with her friend sruthi. Sudhir sharma. ' A engineer who took voluntary retirement. He is very fond of literature and fine arts. For him his priya is a world she is a darling to the man . may be his gene's that priya likes literature and fine arts. He taught morals , love ,maintaining relations with harmony to priya . he off course has no voice in his house because the lady in his life.. uff she is a mystery unveiled ever. Shipra - I already told u she is the reason of mr. sudhir's silence. She was sudhir's classmate in engineering. Unfortunately, by chance, or may that the judge is blind she is ex miss bhuwaneshwar. That made her feel she is a doll. In addition shuidhir's proposal made her feel she is the prettiest human ever on earth. May be she was the mistake of his life. The lady is hyperactive and very hyper of her beauty. She behaves to be a idiot. She is as such priya took a step to bring up her sister and brother. Priya was her daughter well educated, was a in respectable position still she neglected her a lot the fact is she bore priya first in her womb. Priya's brother.he adore and respect his sister so much . he learnd to be independent from his sister. Priya helped him a lot all his education. he was so close darling to priya. Fallen for the rich stubborn girl Natasha. His love and priya's nature brought her to realise the true value of family. Another beauty sick , brainless idiot . he is one of shipra's kind. In fact she was spoilt by shipra. Was pampered by shipra a lot. She is selfish. She never cared for anyone except her. She is capable of anything. Above all she will have the support of shipra. Priya did lot to her but Ayesha never even identified her love. Was a model by profession.CRUEL, EVIL , AND SELFISH IS HER MIDDLE NAME. VIKRAM N NEHA: Ram's friends. These two had a close association with ram and priya. Vikram works with ram. Faithfull friend. They r like family to ram. KK treats neha like her own bahu as vikram is her another son. Neha and priya's bonding is soon been so strong as ram and priya. All four are really good friends. 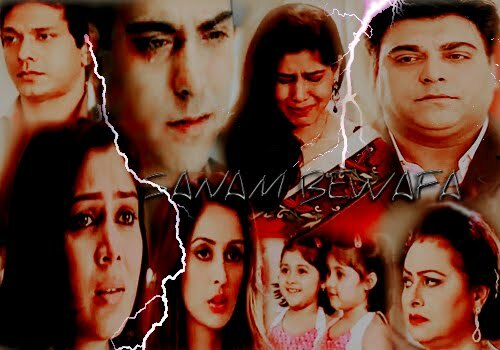 I knw it may be similar to balh in some parts but i wil try not to make it so similar. . Am really not able to go out of the names which are in balh . SANAM BEWAFA is a tragic LOVE story.